Hope she will be able to find the soup ingredients in USA and try to cook it for her dad and even for other family members, if they do like Chinese tonic soup (smile). 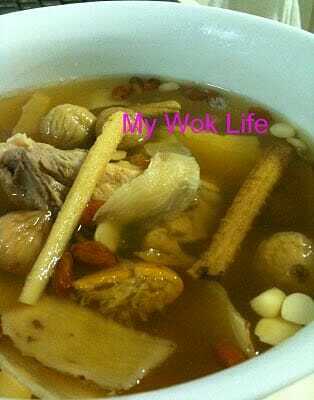 I would surely cook this soup, whenever my family suffers from cough as it helps in relieving cough. Or as and when I feel like, just to drink it for nourishing purposes. It’s fine. We all liked this soup as it tastes mild sweet in the palate. I enjoyed chewing the almonds as they appeared so crunchy to be eaten, just like nuts, even after long boiling hours. Besides the crunch that makes the biting so interesting, these almonds are almost tasteless, while the figs were tasted sweet inside. 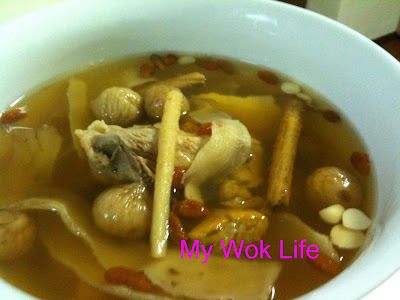 As for the “Chuan Bei Mu” (main lung nourishing herb), though it has more green taste and not so crunchy, but still alright to eat it, if desired. Other than the abovementioned and the common wolfberries, the rest of the Chinese herbs were mainly to be cooked to extract its essence and nutrients. And, there’s no need to laddle all the herbs ingredients when served. The bowlful of herbs in my soup was for illustration purposes only. I discarded and left only those I wanted to eat in the bowl, when served the soup to my family during our dinner meal (laughing). **If opted for adding these, you may wish to reduce the dried tangerine to half a piece instead, depending on how sweet you want the soup to taste. Add water, blanched lean meat/ ribs (if opted) and all ingredients into a croak pot. Then, place croak pot back to its slow cooker. Turn into auto shift mode and simmer for hours. At least 5 hours in low/ auto shift, or keep it simmer from morning before work, till evening after work. Do a taste check before adding salt, 10 minutes before serve. Heat a pot of water over high fire. When boiled, reduce heat to low fire. Add blanch lena meat/ ribs (if opted) and all ingredients into the pot. Simmer for 2 – 3 hours. Do a taste check to see if salt is needed. Serve warm. My soup (shown in the picture) was added with ribs and salt, but also reduced the amount of dried tangerine to just adding half a piece instead of one whole piece of dried tangerine as I preferred a briny-flavoured soup, with just subtle sweetness to bring up the flavour even better, for dinner. However, it’s fine to cook with or without adding meat/ ribs. Addition of salt is, thus, optional. Moreover, this soup is already sweetened, and originally tasteful enough by the dried (sugar coated) tangerine and sweet figs. I cooked it this sweet way, too, sometimes.. I also heard that it’s best try to abstain from meaty stuff during the process of recovery from lung related illnesses. Hence, the choice is yours. This is a low-fat soup with merely 100kcal for a serving of regular bowl, if without addition of meat. Tips: If you are unable to find dried tangerine, replace with 3 – 4 honey dates (蜜枣). * You may do a taste check to determine if you need to add salt or not. * Variation in choice of meat: If you do take pig’s lung, add it instead of pork ribs. Thickly slice pig’s lung, rinse and steep in water for 30 minutes. Blanch in boiling water and drain, before puting to simmer in the soup. would like to check with you..
For this soup, is it suitable for children as young as 1? Hmm… Yes, personally, I think these herbs are mild and generally fine to be drank by all ages, just moderately. However, I think for infant or baby, the snow pear with “Chuan Bei Mu” and honey or rock sugar will be more suitable, if feeding it to baby for couching relieving purpose. I will cook it someday. hi, my son has been sick n coughing non stop… would like to try ur recipe.. but can this be taken when he is also taking western medication? Generally is ok to take, as the ingredients are mild. However, I will suggest you to let the child drunk the soup with 1-2 hours interval with the western medicine, just to pay extra caution, if you wished.